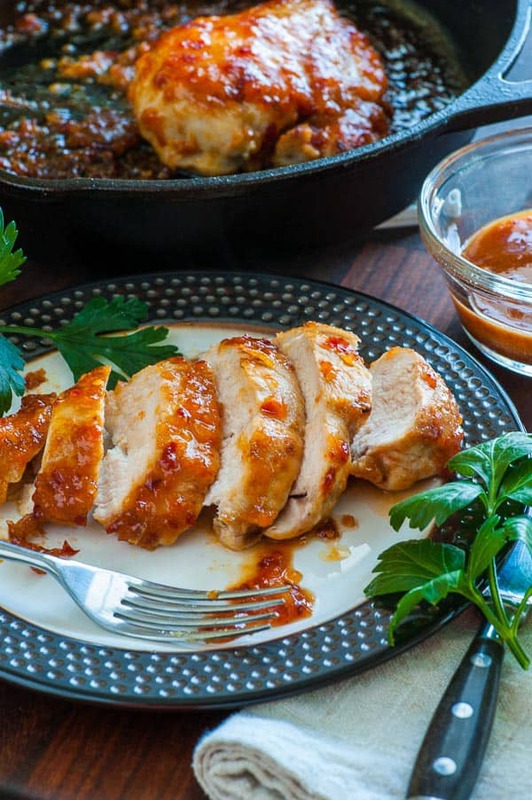 Apricot-chili glazed chicken breast gets browned in the skillet and then gets glazed with sweet apricot preserves and chili garlic sauce and finished in the oven. If you are into spicy food, then this will be right up your alley. The recipe calls for 1/4 cup of the chili sauce which gives the chicken quite a bite on the palate. But for all you heat lovers, it’s definitely a good feel. I mixed up the glaze, which is enough to coat 4 chicken breasts. Since MaryJo and I just need one a piece, there was glazing sauce left which was terrific when a little was mixed with the rice we had with it. I really like the idea of browning the breasts on the stove and then finishing the cooking in the oven. It gives you time to get the other menu items cooked and ready for the table. The Lodge cast iron skillet I used is the perfect pan for this recipe. This is definitely going to be a go-to recipe for chicken dinner in the future. 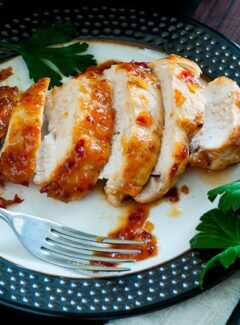 Give apricot chili glazed chicken breasts a try and serve it with rice and a vegetable for a perfect meal. Disclaimer: This recipe post contains an affiliate link which means Joe’s Healthy Meals will earn a small commission if you purchase anything through this link. I costs you no additional money but helps to keep the website up and running. Thank You! 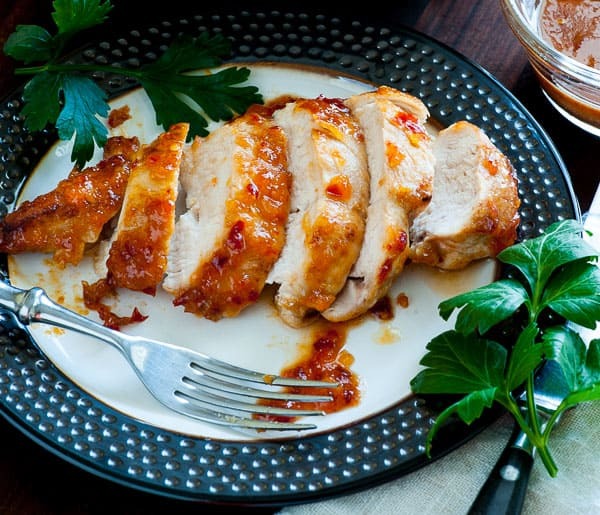 This is an easy to make glazing sauce to liven up the flavor of chicken breasts. 4 skinless , boneless chicken breasts, 6 to 8 oz. ea. Pat the chicken breasts dry with paper towels and salt all sides, then refrigerate uncovered 30 minutes. 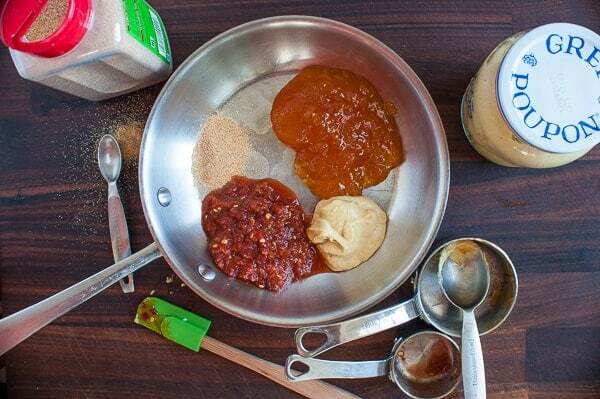 For the glaze, mix together the apricot, chili sauce, mustard and garlic powder in a small skillet and heat to boiling while stirring, then take off the heat and reserve. Add vegetable oil and butter to a heavy, oven safe skillet on medium to medium high. Remove the chicken and pat with paper towels again and place smooth side down in the heated skillet 4 minutes to nicely brown. 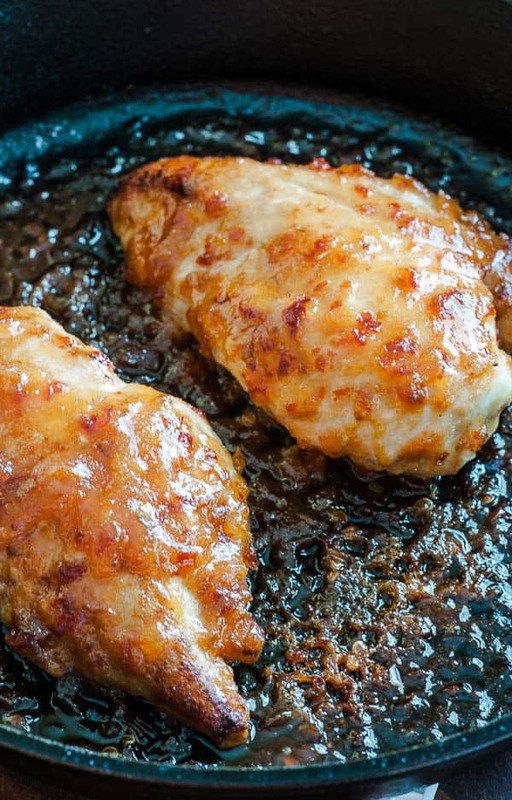 Take the skillet off the burner, turn the breasts browned side up and coat with the glaze. Take out of the oven and place the chicken on a platter and cover with foil for 5 minutes. This was fantastic! It was easy to prepare, and served with a side salad. Thank you for sharing! Thanks Trinity. Glad you liked it. I’m going to have to try this without the chilli sauce. Yum, that sauce is really good and just remembering the flavor of it makes my mouth water! This is right up our alley! We like chicken, and we eat chicken a lot, so this new recipe that includes some “bite” is quite appealing. Plus,we have all the ingredients on hand. Hi Al…hope you enjoy it. Check the temperature of the chicken at 14 to 15 minutes. Pulling the skillet off the stove to take some pictures added to the cooking time due to the heat from the cast iron. Mine turned out to be a little over done after 20 minutes.